New Year’s Eve with a few friends may not present the best opportunity to conduct a scientific drink lab but it sure is a fun way to get the party started! The Tiki lounge is set up with three whiskeys, three sweet vermouths, and Angostura regular and orange bitters. The buffet table offers a variety of chips, pretzels with raspberry honey mustard dip, cheeses, and an unusual but wonderfully delicious maple bacon onion jam. The food warmer keeps the heat on a square pepperoni pizza cut into mini slices as well as a glass pitcher of hot apple cider. Now this is a cocktail hour. My father-in-law drank a classic and budget-friendly Manhattan cocktail every evening, made with Canadian Club and Martini & Rossi sweet vermouth. 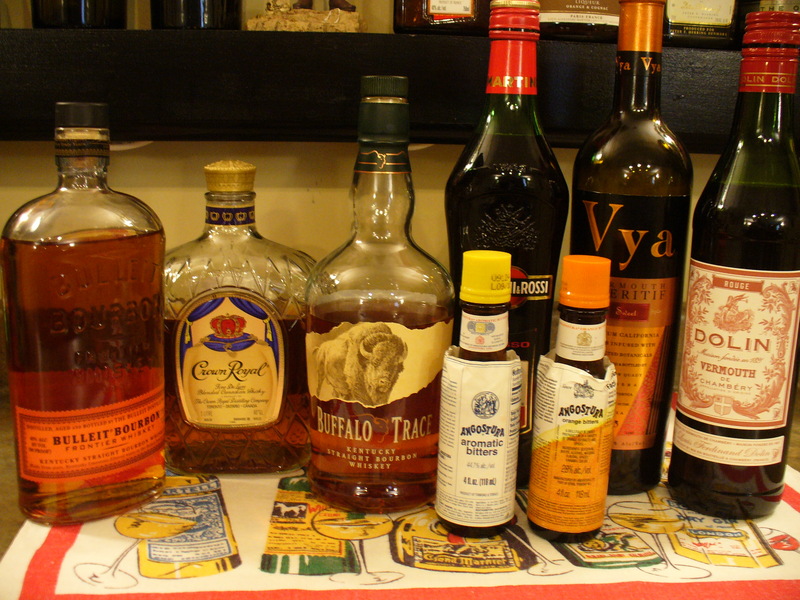 The classic recipes indicate rye as the whiskey of choice, however we opted for Bulliet and Buffalo Trace bourbons and our souvenir Crown Royal from the duty-free shop at Niagara Falls. Our sweet vermouths include Dolin, Vya, and Martini & Rossi. First we taste the three whiskeys. The Bulliet is spiciest and harshest of the three. Buffalo Trace has a smoky flavor with a moderate burn and a hint of vanilla. Crown Royal is slightly sweeter and by far the smoothest, but loses out in punch and character. The Dolin tastes the sweetest of the three vermouths. We mix the cocktails with a standard ratio of two parts whiskey to one part vermouth and a dash of bitters. The Manhattans made with Bulliet and Buffalo Trace are dominated by the bourbon flavor profile while the vermouth takes a back seat. Crown Royal combines especially well with Dolin vermouth, uniting their sweet essences with the tart orange bitters. Just add ice and stir, or shake over ice and pour to create a frothy head!